This article is about the men's team. For the women's team, see North Macedonia women's national football team. The North Macedonia national football team has yet to qualify for a World Cup Finals tournament. In their attempt at qualifying for the 2010 World Cup, they finished fourth in Group 9 with seven points. Surprisingly, due to the closeness of the group throughout the campaign (only five teams in the group), Macedonia remained in contention to qualify until the final group game, which Macedonia lost 2–1 away to Norway, although Norway would be the only runner up to not make the play offs that year. Macedonia was part of the Yugoslavia until Seoul 1988. After that, they never managed to qualify from Barcelona 1992 to Rio 2016. In 1994, Macedonia became a member of FIFA and UEFA after the break-up of Yugoslavia. The team began its football journey with a 4–1 win against Slovenia in a friendly on 13 October 1993 under coach Andon Dončevski. They went on to win their next two friendlies against Slovenia and Estonia before suffering their first loss against Turkey on 31 August 1994 (before this they lost to Club Atlético Peñarol 0–4 in Montevideo in February 1994). The inaugural Macedonian side featured Darko Pančev, who won the European Cup with Red Star Belgrade in 1991 and also played for Internazionale in Italy. The Euro 96 Qualifiers was the first major qualifying tournament that Macedonia participated in as an independent nation and they were grouped with Spain, Denmark, Belgium, Cyprus and Armenia. In their opening game, which was also their first ever official match, Macedonia was drawn against the reigning European Champions Denmark. The game was played in Skopje on 7 September 1994 and it finished 1–1 with Macedonia leading for most of the game after scoring in the fourth minute. In this qualifying stage, Macedonia suffered one of its worst defeats when they lost 0–5 to Belgium at home on 7 June 1995. They failed to qualify for Euro 96, finishing fourth in the group with seven points. Macedonia's first qualifying attempt for the World Cup saw them grouped with Romania, Ireland, Lithuania, Iceland, and Liechtenstein. The tournament began on 24 April 1996 with a 3–0 win at home against Liechtenstein. On 9 November 1996, Macedonia recorded their biggest win ever, an 11–1 thrashing of Liechtenstein. Half of the goals Macedonia scored in the entire campaign were scored in this match alone. Macedonia failed again to qualify for the 1998 World Cup in France, finishing fourth in the group on 13 points. Macedonia's journey to qualify for the Euro 2000 tournament in the Netherlands and Belgium saw them grouped with FR Yugoslavia, Ireland, Croatia, and Malta. They once again opened their qualifying campaign with a win after beating Malta 4–0 at home on 6 September 1998. Their most notable result in the campaign was a 1–1 draw against Croatia in June 1999, with an equalizer of Gjorgji Hristov 10 minutes before the end of the game. They were helped Yugoslavia to qualify directly and eliminate Croatia, because were drawn 1–1 against Republic of Ireland with a last minute equalizer of Goran Stavrevski. However, they failed to qualify again, finishing fourth in the group with eight points. Macedonia's 2002 World Cup qualifying campaign saw them grouped with Sweden, Turkey, Slovakia, Moldova, and Azerbaijan. They were unsuccessful in their opening match, going down to Slovakia 2–0 in Slovakia on 3 September 2000. The Macedonians once again failed to qualify for the 2002 World Cup, which was held in Japan and South Korea, as they finished fourth in the group with seven points. The Euro 2004 Qualifiers saw Macedonia grouped alongside England, Turkey, Slovakia, and Liechtenstein. Despite Macedonia failing to win its first four games of the campaign, they managed to record one of its most memorable results of its short history. On 16 October 2002, Macedonia played former world champions England in Southampton, which was England's first home game in Southampton in almost 100 years. Macedonia grabbed the lead early in the first half after Artim Šakiri scored directly from a corner kick, leaving English goalkeeper David Seaman stunned. England soon leveled the game, but not before Macedonia managed to take the lead once again. However, the game ended 2–2 after England managed to score a second equalizer in the second half. Macedonia lost to England 2–1 at home in the return leg, which took place in September 2003. Macedonia's only win of the campaign came on 7 June 2003, when they beat Liechtenstein 3–1 at home. Macedonia did not qualify for the Euro 2004 tournament, which was held in Portugal, finishing fourth in the group with six points. Macedonia was drawn in Group 1 and was grouped with the Netherlands, Czech Republic, Romania, Finland, Armenia, and Andorra. They managed to open their campaign with a comfortable 3–0 win at home against Armenia on 18 August 2004. Macedonia did not win another home game for more than three years. On 9 October 2004, Macedonia managed to hold the Netherlands to a surprise 2–2 draw in Skopje in front of a crowd of 17,000 at the Skopje City Stadium, but in their next game, just four days later, they suffered one of its most embarrassing defeats, a 1–0 loss away to Andorra, one of the world's weakest teams. Also in this tournament, Macedonia set a new team record for most goals conceded in a game when they lost 6–1 away to Czech Republic on 8 June 2005. Macedonia went on to concede a further eight goals in the next two qualifying games, both against Finland. On 23 August 2005, coach Slobodan Santrač resigned as coach of Macedonia after just five months on the job due to personal problems, with former player Boban Babunski temporarily taking over as coach. The resignation came just days after they were beaten 3–0 by Finland in Skopje. Despite their poor performance during the 2006 World Cup qualifying campaign, Macedonia managed to end the campaign on a high with a 0–0 draw against the Netherlands in Amsterdam. This result meant that Macedonia, with the two draws against the Netherlands, was the only team in the group not to have been defeated by the Netherlands. The Netherlands won 10 of their 12 games in the 2006 World Cup campaign. Macedonia failed to qualify for the 2006 World Cup in Germany, finishing fifth in the group with nine points. Following the completion of the 2006 World Cup qualifying tournament, in November 2005, Macedonia took part in a friendly tournament in Iran consisting of four teams, each team from a different continent. The teams were Macedonia, Iran, Paraguay, and Togo. In their opening match, they won 2–1 against host nation Iran, booking a spot in the final against Paraguay. They lost the final against Paraguay 0–1. Macedonia was the only nation in this friendly tournament not to have qualified for the 2006 World Cup. On 27 January 2006 in Switzerland, Macedonia was placed in Group E for the Euro 2008 qualifiers alongside England, Croatia, Russia, Israel, Estonia, and Andorra. On 17 February 2006, former Slovenian national team coach Srečko Katanec was appointed as the head coach and was given a two-year contract. In the lead-up to the beginning of the qualifiers for Euro 2008, Macedonia managed two results against sides in friendly matches. They beat Ecuador 2–1 in Madrid, their first ever win against a South American nation, and a week later, followed that up with a 1–0 win against Turkey. Macedonia opened their UEFA Euro 2008 qualifying campaign with a 0–1 win away to Estonia on 16 August 2006. Goce Sedloski scored for Macedonia in the 73rd minute, which meant that Macedonia was the first team to score a goal in the Euro 2008 qualifying campaign. Macedonia hosted England on 6 September 2006 in their second game of the qualifiers. England went on to win 0–1 after Peter Crouch scored for the away side in the 46th minute. This was the first time that Macedonia failed to score against England. A month later, on 7 October 2006, the two teams met once again in Manchester, where England was held to a 0–0 draw in front of 72,062 people. On 17 October 2007, Macedonia recorded their first win on home soil since August 2004 when they easily defeated Andorra 3–0 in Skopje in an emotional game as it was the day after the death of pop icon Toše Proeski. Macedonia then recorded one of their most impressive wins to date when they picked up a 2–0 victory over eventual group winners Croatia on 17 November 2007, causing the biggest upset of Group A; it was also a first win for Macedonia over a side that was ranked in the top ten of the FIFA World Rankings. Despite some surprising results, Macedonia once again failed to qualify for the Euro 2008 Finals after finishing fifth in the group with 14 points. On 25 November 2007, just days after Macedonia completed its qualifying campaign for Euro 2008, the groups for European qualifiers for the 2010 World Cup were held in Durban, South Africa, where Macedonia was seeded in Pot 4 and grouped along with the Netherlands, Scotland, Norway and Iceland. Manager Srečko Katanec received a two-year extension on 21 December 2007, which meant he would be under contract through the end of the 2010 World Cup qualifiers. In the lead up to the campaign, Macedonia played three friendlies against Serbia, Bosnia and Herzegovina and Poland, which all ended in draws. Macedonia opened their campaign with a 1–0 home win against Scotland on 6 September 2008 when Ilčo Naumoski scored on a rebound after a well taken free kick by Goce Sedloski. Following these impressive results, Macedonia moved up 10 places to 46 in the FIFA World Rankings list for October 2008 which was their highest ever position on the rankings list. Srečko Katanec left the team following a 4–0 loss to the Netherlands in Amsterdam in April 2009 for allegedly getting into an argument with star player Goran Pandev. Soon afterwards, the manager of the under-21 squad, Mirsad Jonuz, became the new coach of the Macedonian senior team and was signed until the end of the World Cup qualifying campaign. On 5 September, Macedonia lost 2–0 to Scotland and then suffered another loss to Norway, which meant that Macedonia once again did not qualify for the World Cup. On 7 February 2010, Macedonia was placed in Group B for the Euro 2012 qualifiers alongside Russia, Slovakia, Republic of Ireland, Armenia and Andorra. In the lead up to the qualifiers, an under-strength Macedonia side played friendlies against Azerbaijan, Romania and Malta, winning the first two 3–1 and 1–0 respectively, and tied 1–1 against Malta later the summer. However, the qualifications did not go as well. Instead, Macedonia finished in a disappointing fifth position in the group with only two wins against minnows Andorra and two draws, against Armenia and Slovakia, both at home. Due to the poor results in the qualifications, manager Mirsad Jonuz was dismissed on 18 June 2011 and replaced by John Toshack, who led the Macedonia in the last four matches to one win, one draw and two losses. Macedonia's 2014 World Cup qualifying campaign saw them grouped with Croatia, Serbia, Belgium, Scotland and Wales. In August 2012, prior to the qualifications, John Toshack would leave as manager and would be replaced by Čedomir Janevski. The national team would begin the qualification round with a loss to Croatia in Zagreb and would go on to draw against Scotland in Glasgow. They lost again to Croatia and won against Serbia in Skopje after a penalty kick taken by Agim Ibraimi. Later in qualification, the national team would go on to lose twice to the eventual group winners Belgium. Macedonia would win against Wales and lose against Scotland at home. Around the end of September 2013, Janevski would leave the team for Belgian club R.A.E.C. Mons and would be replaced by Zoran Stratev for the last two matches. The national team would suffer a disastrous finish to their qualification campaign with away losses to Wales and Serbia. They would finish last in their group. After the unsuccessful qualification run, Goran Pandev, Nikolče Noveski, Veliče Šumulikoski and others would retire from the national team due to turbulent relations with the Football Federation of Macedonia. In November 2013, Boško Gjurovski would be appointed the new national team manager. On 23 February 2014, Macedonia was placed in Group C for the Euro 2016 qualifiers alongside Spain, Ukraine, Slovakia, Belarus and Luxembourg. However, the national team had a disastrous start against Spain in Valencia with a 1–5 loss. The only win they collected was against Luxembourg in Skopje. After that match, Macedonia was brought into disastrous run of a four losses. Due to the poor results in the qualifications, manager Boško Gjurovski was dismissed on 7 April 2015 and replaced by Ljubinko Drulović. The miserable run, however, continued with the losses against Slovakia and surprisingly Luxembourg by late goal of Sébastien Thill, after a missed penalty kick of Besart Abdurahimi. Their disappointing performances was continued against Spain in Skopje, beside their good game, and against, Ukraine also home. In the last match against Belarus in Barysaw, Macedonia played a draw which broke the black streak of seven losses. The team still ended the qualifications at the last place of the group with a worse head-to-head scoring with Luxembourg. On 25 July 2015, in the middle of the Euro 2016 qualifying, the group draws for European qualifiers for the 2018 World Cup were held in Saint Petersburg. Macedonia was seeded in Pot 5 and grouped along with Spain again, for the first time with Italy, with the rival Albania and with Israel and Liechtenstein. In October 2015, Drulović left the National Team to Serbian club Partizan and the manager place was taken over the former manager of Rabotnički and former assistant coach of the national team Igor Angelovski. In the same month, the Macedonian football superstar Goran Pandev came back to the national team after the two years of absence. Macedonia started with another disappointing performance with a loss to Albania in Shkodër, with a goal scored by Bekim Balaj in the last moments of the game, in a match that was played over two days because of interruption in the 76th minute due to very bad weather conditions. Later on they also lost to Israel at home by missing a penalty kick by Adis Jahović in the last moments of the game. After that, the national team also lost to Italy beside their 2–1 lead with the goals scored by Ilija Nestorovski and Ferhan Hasani. At the end of the another year to forget Macedonia was outclassed by Spain in Granada (4–0) and after four rounds Macedonia had not scored a single point which was the worst qualifying start in the history of the national team. Finally, in March 2017, Macedonia recorded their first win in the qualifying against Liechtenstein (3–0). Then again, expectantly, have lost to a Spain in Skopje (1–2). They also defeated Israel away through the lone goal by Goran Pandev, which was also a first ever win against Israel. However, in the next round Macedonia missed a good opportunity to collect yet another win, this time against Albania in Strumica, but the game ended with a draw (1–1). In the first edition of the UEFA Nations League, Macedonia was played in League D, the fourth and lowest division of that competition. Macedonia were drawn in Group 4 with Armenia, Liechtenstein and Gibraltar. The national team were won the group with five wins and only one loss to Armenia away (0–4), and were promoted to the League C for the next edition of the Nations League, and were secured minimally the UEFA Euro 2020 qualifying play-offs. For the UEFA Euro 2020 qualifying North Macedonia was placed in Group G, along with Austria, Israel, Latvia, Poland and Slovenia. Squad named for the UEFA Euro 2020 qualifying Group G matches against Latvia and Slovenia on 21 and 24 March 2019. Caps and goals as of 24 March 2019 after game against Slovenia. Ferhan Hasani was in the squad only for the match against Latvia, but withdrew for the one against Slovenia due to an injury. U21 = Currently with the U21 national team. This is a list of Macedonian captains for five or more official and friendly matches. Goran Pandev is the current captain of the Macedonian National Team. Note: Some of the other players to have captained the team include: Dragi Kanatlarovski (1 cap) 1993, Ilija Najdoski (3) 1994, Dančo Celeski (2) 1995, Ljupčo Markovski (4) 1995 to 1997, Mitko Stojkovski (2) 1998, Boban Babunski (2) 1996 and 1999, Gjorgji Hristov (2) 2002 to 2003, Petar Miloševski (2) 2004 and 2008, Ilcho Naumoski (1) 2008, Igor Mitreski (4) 2007 to 2010, Aleksandar Lazevski (1) 2010, Nikolče Noveski (4) 2011 to 2013, Daniel Mojsov (1) 2012, Boban Grncharov (3) 2012 to 2014, Blazhe Ilijoski (1) 2014, Blagoja Todorovski (1) 2014 , Vanche Shikov (4) 2015 and Ivan Trichkovski (1) 2018. FIFA-ranking yearly averages for Macedonia. ^ a b "SVN – MKD match report". MacedonianFootball.com. Retrieved 2 June 2016. ^ "MKD – DEN match report". MacedonianFootball.com. Retrieved 2 June 2016. ^ "MKD – BEL match report". MacedonianFootball.com. Retrieved 2 June 2016. ^ "EURO 1996 Qual's". MacedonianFootball.com. Retrieved 2 June 2016. ^ "LIE – MKD match report". MacedonianFootball.com. Retrieved 2 June 2016. ^ "WC 1998 Qual's". MacedonianFootball.com. Retrieved 2 June 2016. ^ "EURO 2000 Qual's". MacedonianFootball.com. Retrieved 2 June 2016. ^ "WC 2002 Qual's". MacedonianFootball.com. Retrieved 2 June 2016. ^ "ENG – MKD match report (2002)". MacedonianFootball.com. Retrieved 2 June 2016. ^ "MKD – ENG match report (2003)". MacedonianFootball.com. Retrieved 2 June 2016. ^ "EURO 2004 Qual's". MacedonianFootball.com. Retrieved 2 June 2016. ^ "MKD – NED match report". MacedonianFootball.com. Retrieved 2 June 2016. ^ "AND – MKD match report". MacedonianFootball.com. Retrieved 2 June 2016. ^ "NED – MKD match report". MacedonianFootball.com. Retrieved 2 June 2016. ^ "WC 2006 Qual's". MacedonianFootball.com. Retrieved 2 June 2016. ^ "MKD – ENG match report (2006)". MacedonianFootball.com. Retrieved 2 June 2016. ^ "ENG – MKD match report (2006)". MacedonianFootball.com. Retrieved 2 June 2016. ^ "Macedonia finally wins in Skopje". MacedonianFootball.com. 18 October 2007. Retrieved 8 June 2016. ^ "Macedonia – Croatia 2:0". MacedonianFootball.com. 17 November 2007. Retrieved 2 June 2016. ^ "EURO 2008 Qual's". MacedonianFootball.com. Retrieved 2 June 2016. ^ "2010 World Cup draw". MacedonianFootball.com. 25 November 2007. Retrieved 2 June 2016. ^ "Katanec stays with Macedonia". MacedonianFootball.com. 21 December 2007. Retrieved 2 June 2016. ^ "Katanec lost the control over the team". MacedonianFootball.com. 7 April 2009. Retrieved 2 June 2016. ^ "Mirsad Jonuz named as new Macedonian coach". MacedonianFootball.com. 16 May 2009. Retrieved 2 June 2016. ^ "Russia, Slovakia, Ireland, Armenia and Andorra". MacedonianFootball.com. 7 February 2010. Retrieved 2 June 2016. ^ "Mirsad Jonuz fired!". MacedonianFootball.com. 18 June 2011. Retrieved 2 June 2016. ^ "John Toshack is the new manager". MacedonianFootball.com. 7 August 2011. Retrieved 2 June 2016. ^ "Tough group for Macedonia!". MacedonianFootball.com. 30 July 2011. Retrieved 2 June 2016. ^ "Manager John Toshack relieved of his duties". 12 August 2012. Retrieved 2 June 2016. ^ "Janevski officially presented as new manager". 22 August 2012. Retrieved 2 June 2016. ^ "Macedonia – Serbia 1:0". MacedonianFootball.com. 16 October 2012. Retrieved 2 June 2016. ^ "Janevski leaves Macedonia NT for Mons post". MacedonianFootball.com. 27 September 2013. Retrieved 2 June 2016. ^ "Zoran Stratev named caretaker manager". MacedonianFootball.com. 28 September 2013. Retrieved 2 June 2016. ^ "Goran Pandev to retire from national team". MacedonianFootball.com. 17 October 2013. Retrieved 2 June 2016. ^ "Бошко Ѓуровски – нов селектор на македонската репрезентација!" (in Macedonian). Ekipa.mk. 26 November 2013. Retrieved 2 June 2016. ^ "EURO 2016: Macedonia drawn in Group C". MacedonianFootball.com. 23 February 2014. Retrieved 2 June 2016. ^ "Официјално: Бошко Ѓуровски доби отказ од ФФМ" (in Macedonian). Ekipa.mk. 7 April 2015. Retrieved 2 June 2016. ^ "Љубинко Друловиќ е нов селектор на Македонија!" (in Macedonian). Ekipa.mk. 23 April 2015. Retrieved 2 June 2016. ^ "Spain, Italy drawn in Macedonia's group". MacedonianFootball.com. 25 July 2015. Retrieved 2 June 2016. ^ "Збогум, Македонија: Партизан го потврди изборот на Друловиќ" (in Macedonian). Ekipa.mk. 15 October 2015. Retrieved 2 June 2016. ^ "ФФМ потврди: Ангеловски нов предводник на А-тимот" (in Macedonian). Ekipa.mk. 16 October 2015. Retrieved 2 June 2016. ^ "НАЈРАДОСНАТА ВЕСТ: Горан Пандев се враќа во репрезентацијата!" (in Macedonian). Ekipa.mk. 20 October 2015. Retrieved 2 June 2016. ^ "Прекинатиот меч Албанија – Македонија (1–1) ќе се доигра утре, од 76.минута" (in Macedonian). Ekipa.mk. 5 September 2016. Retrieved 7 October 2016. ^ "WC qualifier: Albania – Macedonia 2:1 (Video)". MacedonianFootball.com. 6 September 2016. Retrieved 7 October 2016. ^ "Macedonia – Israel 1:2 (Photo&Video)". MacedonianFootball.com. 6 October 2016. Retrieved 7 October 2016. ^ "Macedonia – Italy 2:3 (Photo&Video)". MacedonianFootball.com. 9 October 2016. Retrieved 13 November 2016. ^ "Spain – Macedonia 4:0 (Video)". MacedonianFootball.com. 12 November 2016. Retrieved 13 November 2016. ^ "Македонија со убедливо најлош квалификациски старт во историјата!" (in Macedonian). Ekipa.mk. 13 November 2016. Retrieved 14 November 2016. ^ "Македонија убедливо со 3:0 победи во Лихтенштајн" (in Macedonian). FFM.mk. 24 March 2017. Retrieved 27 March 2017. ^ "Macedonia – Spain 1:2 (Video))". MacedonianFootball.com. 12 June 2017. Retrieved 6 September 2017. ^ "Israel – Macedonia 0:1 (Video)". MacedonianFootball.com. 3 September 2017. Retrieved 6 September 2017. ^ "Macedonia – Albania 1:1 (Video)". MacedonianFootball.com. 5 September 2017. Retrieved 6 September 2017. ^ "УЕФА потврди: Македонија носител во Лига на нации! (ФОТО)" (in Macedonian). Sport1.mk. 11 October 2017. Retrieved 11 October 2017. ^ "Лига на нации: Македонија во група со Ерменија, Лихтенштајн и Гибралтар" (in Macedonian). Gol.mk. 24 January 2018. Retrieved 24 January 2018. ^ "Мисијата комплетирана – земавме залет за Европско!" (in Macedonian). Ekipa.mk. 19 November 2018. Retrieved 19 November 2018. ^ "EURO 2020 qualifying draw made". MacedonianFootball.com. 2 December 2018. Retrieved 2 December 2018. ^ "Telekom Arena, Skopje". EU-Football.info. Retrieved 1 July 2017. ^ "Gradski Stadion Goce Delčev, Prilep". EU-Football.info. Retrieved 1 July 2017. ^ "Stadion Mladost, Strumica". EU-Football.info. Retrieved 1 July 2017. ^ "Gradski Stadion, Tetovo". EU-Football.info. Retrieved 1 July 2017. ^ "Nikola Mantov Municipal Stadium, Kocani". EU-Football.info. Retrieved 1 July 2017. ^ "Gradski Stadion, Kumanovo". EU-Football.info. Retrieved 1 July 2017. ^ "List of all senior national team coaches". MacedonianFootball.com. Retrieved 2 June 2016. ^ "FIFA-ranking yearly averages FYR Macedonia". fifa.com. Retrieved 20 September 2018. 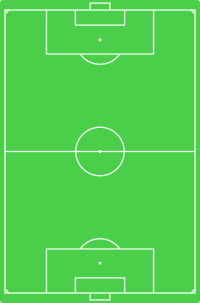 Wikimedia Commons has media related to North Macedonia national association football team.